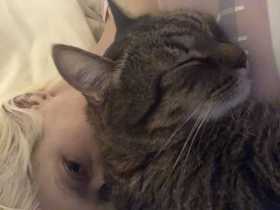 Lost Cat, neutered brown Male tabby in the Hollywood and Highland area, lost jan 25 between 10pm and midnight. Answers to Bucko or Bubba, is 8 years old and larger side, definitely chubby. Extremely friendly. Is wearing a collar (rainbow trout print) but no tags. He is an indoor kitty who slipped out a door that hadn’t fully latched closed.